MPN: Pebble4. Type: ID Card Printer. We can only apologize for this, and hope this does not cause you any problems. BER (Beyond Economical Repair). Okay Condition – Large Dents, Cracked Casing etc. Tested: Working – May have a Fixable Fault (e.g. Cracked Screen / Missing Parts etc.). Used - Evolis Badgy100 Single Sided Dye Sublimation/Thermal Transfer Printer Colour. Condition is Used and in working order. Including drivers disc, a part used Black print ribbon and approximately 50 cards. New colour ribbons readily available on eBay. Postage offered to UK ONLY. Good used condition only printed368 Cards. 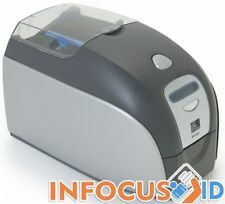 Fully Working ID Card Printer:- MAGICARD ENDURO . Condition is Used. Used for printing your own business or ID cards. Tested and printing well. Worth £420 on Ebay. Comes with part used ribbon and some cards. Seems to work well. Dispatched with eBay delivery – Shutl 1 day. Its just been cleaned with Zebra cleaning cards. It still has approx 3/4 ribbon left (genuine zebra YMCKO i-series). - 4 genuine zebra cleaning cards (2 normal 2 long). - box of white plastic ID cards with a hologram. What's Included ?. 1x Zebra P430i. The Datacard SP35 Plus card printer is one of the most convenient choices in the SP Series line. It includes everything you need for one-sided, full-colour ID card printing in a compact, plug-and-play design that is easy to use. 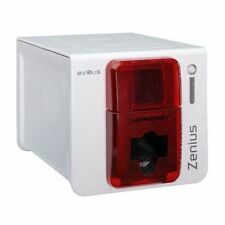 Zebra ZXP Series 8 Double Sided Re-Transfer ID Card Printer (USB, NETWORK). Heavy discolouring to casing. Does not affect functionality. Add to Favourites. Your right to cancel. Here we have a Magicard Rio 2e Std Single Sided Colour ID Card Printer. (USB NETWORK) with Blue Hoppers. HoloKote® std. logo security design option. Connection:- USB, NETWORK. This printer is in "Fantastic Condition and working perfectly. USB & Parallel Connections. We will always go out of our way to source the product you are looking for. Add to Favourites. New listingMagicard Rio Pro C - DUO Colour ID Card Printer with Combi Encoder. This printer is a very high specification top of the range model. Serial & Printhead no's together with the card counter for each printer is recorded for security purposes. Magicard Rio Pro - Single Sided Colour ID Card Printer. Only 1620 Cards Printed. Here we have a "AS NEW" Magicard Rio Pro - Single Sided ID Colour Card Printer. Only 1620 cards printed. Serial & Printhead no's together with the card counter for each printer is recorded for security purposes. Here we have a Magicard Rio 2e Std Single Sided Colour ID Card Printer. (USB NETWORK). HoloKote® std. logo security design option. Connection:- USB, NETWORK. This printer is in "Fantastic Condition and working perfectly. SwiftColor SCC-4000D Single-Pass Digital Inkjet Card and Envelope Printer. Inkjet (single pass printing). Card Printer Ribbons. WE ARE THE UK's NUMBER ONE SUPPLIER! Print Technology Ink jet (single pass printing). 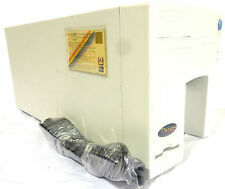 Here we have an "As New" Duracard Durable ID 300 Card Printer - White. Serial & Printhead no's together with the card counter for each printer is recorded for security purposes. Latest drivers for PC and MAC are available from the Durable website. New listingMagicard Enduro + M Single Sided Colour ID Card Printer - (575 cards printed). Here we have an "IMMACULATE" Magicard Enduro M Single Sided ID Card Printer. Mag Encoder Model. Only 575 Cards printed from new. This printer is in fantastic new looking condition and working perfectly. 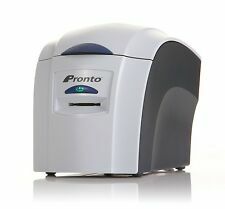 Magicard Pronto ID Card Printer. Condition is Used. Dispatched with tracked signed for. Printer was bought new and only a handful of times. Has lots of ribbon left as put a 300 print ribbon in and tested a couple of cards. Also comes with over 100 blank ID cards along with some magistrip cards and access control cards. In original box with all cables. New condition no signs of wear or tear. Can send more photos upon request. Refurbished Zebra P110i A Grade Colour Plastic Card Printer Complete with power adaptor. The ribbon has been removed for security purposes. All hard drives are fully tested by performing a HMG Infosec Level 5 wipe on them. Everything is fully tested unless otherwise stated. 170 full YMCKOK per roll. Zebra 800015-448 ribbon is for use with the following Zebra printers YMCKO color ribbon. 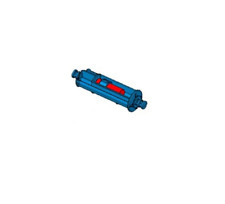 Part Number: 800015-448. New Open Box. 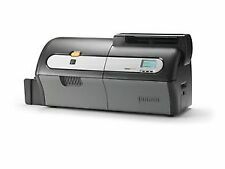 Zebra P110i Single Sided Full Colour Card Printer. (Only 868 Cards Printed). Here we have a "Excellent Looking" Zebra P110i Single Sided Colour ID Card Printer. Only 868 printed YMCKO colour cards. Serial & Printhead no's together with the card counter for each printer is recorded for security purposes. Model Avansia Retransfer. Avansia is exceptionally fast with an output of more than 140 single-sided color cards per hour. THE PREMIUM RETRANSFER PRINTER FOR HIGH DEFINITION CARDS. New RT4F010EAA (YMCK) Colour Ribbon & RTCL009EAA Re-Transfer Film good for 500 cards & New Cleaning Roller & Kit worth £185. With crisp images, vibrant colours and top quality output, Fargo's HDP5000 really is an industry leader in its design. This model is the most affordably priced printer with the ability to print in high definition, creating an image quality that looks more like a photograph than an ID card. The Magicard Pronto printer allows you to produce an on-demand personalised card in seconds. Its intuitive design with a colour-coded status LED, USB interface and Microsoft certified plug and play driver make the Pronto easy to use, set up and operate straight out of the box. “It’s an affordable alternative for those applications where full-color printing is not necessary, but personalized cards can add efficiency, security or functionality.”. The Persona M30 is perfect for card programs such as. Considered one of the best entry-level printers on the market, its simple and lightweight design make it ideal for smaller workspaces, whilst still producing sharp and colour-rich images at the touch of a button. 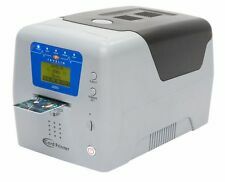 Magicard Enduro3E Dual Sided ID Membership Card Printer . Magicard Enduro3E Dual Sided ID Membership card printer. 18 months old hardly used. Comes with replacement ribbon, cleaning spool and Blank ID cards. Retailing normally at £675 plus vat. 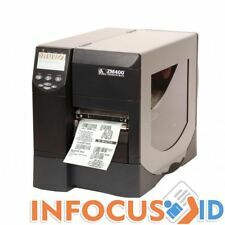 Zebra ZXP Series 9 Single-Sided Re-Transfer ID Card Printer. NO PLASTIC TRAYS. 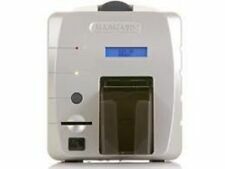 The Magicard Ultima is a touch-screen retransfer ID card printer that produces high-definition ID cards like no other. Ribbon TypeStandard Retransfer. Output Hopper Card Capacity200. Card Printer Ribbons. Here we have a "Fantastic Looking" ZXP Series 8 Re-Transfer Double Sided ID Card Printer. Serial & Printhead no's together with the card counter for each printer is recorded for security purposes. Interface:- USB, NETWORK. The next generation HID FARGO HDPii ID card Printer and Encoder prints and encodes. Card images are sealed on the underside of HDP Film for increased durability and fraud protection, and replicate the look of preprinted cards. All tested but out of box. 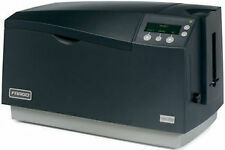 New listingDatacard SP35 Single Sided Colour ID Card Printer (Less than 940 cards printed). Here we have a Datacard SP35 Single Sided Colour ID Card Printer. Less than 940 cards printed. Sample colour test cards included. The printer is in fantastic new looking condition. Serial & Printhead no's together with the card counter for each printer is recorded for security purposes. Magicard Pronto ID Card Printer Bundle - Includes Ribbon & Cards & Software ! The Magicard Pronto printer's aesthetic curves hide an ultra-robust product. Its light and compact design makes it easy to transport to any location and reside on any counter or desktop. New UltraDriver Our user-friendly printer driver for the Magicard printers is now available in seven languages; English, Spanish, French, German, Italian, Portuguese and Chinese. 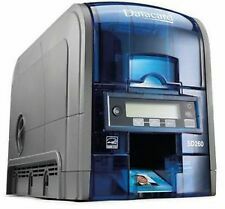 Here we have a Datacard SP35 Single Sided Colour ID Card Printer. The printer is in fantastic new looking condition. Serial & Printhead no's together with the card counter for each printer is recorded for security purposes. Magicard Rio 2e Std Single Sided Colour ID Card Printer (USB + NETWORK)VAT Incl. Almost every company, college or organisation have ID cards for security and safety reasons. And of course, all these cards came from a printer. ID card printers are a must-have for most places, particularly places like colleges or universities where new students are in and out. You wouldn't have an ID card printer if you didn't need to use it a lot. The minimum quota for ID card printers is the ability to print at least 500 cards a day. This should be easy because most printers can print at least 150 cards in one go. Keep it simple with a built-in laminator so that no extra effort is required and people can get on with their job. Print method options should also be available in more modern ID card printers. The ability to print only the card face alone or both sides of the ID card is important, as most companies add barcodes to the back of their ID cards to make scanning in and out easy and manageable. As mentioned about the barcodes, encoding should be available on most modern printers. This means the ability to add holograms, barcodes, smart card features or RFID, the latter of which boost the price of ID card printers up. This helps keep security tight and everything looking professional. The most well-known ID card printers are manufactured by Canon, Datacard, Zebra, Magicard, and much more. The Magicard Enduro3e printer model has been praised for its security, as it has the ability to add to add a Holokote mark to every card printed, which reduces the risk of a card being cloned. On the other hand, Fargo models have been complimented on their high definition, with the ability to print at 300dpi. There are many more options available, with some printers going up to 600dpi or printing 200 to 300 cards in one session.